1. Prepare Pork Chops with Grainy Mustard Sauce: In large skillet, heat oil over medium-high heat until hot but not smoking. Sprinkle pork chops with salt and pepper and add to skillet. 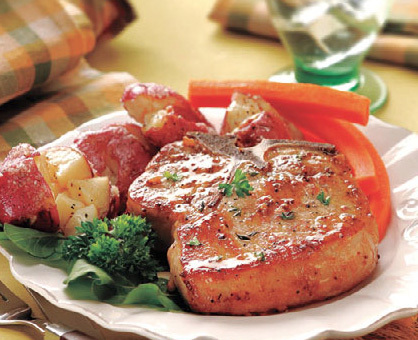 Cook pork chops 6 to 8 minutes or until both sides are golden brown, turning once. 2. Reduce heat and add garlic and shallot to pan; cook 30 seconds. Add wine and cook 2 minutes. Add broth and simmer, partially covered, 8 to 10 minutes or until pork chops are cooked through and reach an internal temperature of 145°. Remove from heat and remove pork chops from pan. Stir in mustard and butter. 3. Meanwhile, prepare “Smashed” Potatoes: Pierce each potato 3 or 4 times with fork, and place in single layer on microwave-safe plate. Microwave on high 8 to 10 minutes or until cooked through, turning potatoes halfway through cooking time. 4. With back of large spoon, slowly press down on each potato to smash. Drizzle oil over potatoes, and sprinkle with salt and pepper. 5. To serve, place pork chops and potatoes on 4 individual plates. Spoon mustard sauce over pork chops and sprinkle with parsley, if desired.